CasinoReviewTruth - Baccarat Strategy - What are the Best Strategies for Baccarat? What are the Best Strategies for Baccarat? It's not surprising that you should ask that question, since, after learning how to play baccarat, everybody starts looking for a consistent way to win. However, baccarat is one casino game no one has been able to strategize. Rounds are independent of one another, and there's a random 6- or 8-deck of cards, so card counting is almost useless. People normally depend on card counting anyway, along with streaks and patterns. If you know how to play baccarat, though, then you know that all of the above depend on chance, and chance also says that you have the same 50% chance of winning with every hand. So there's really no set strategy for baccarat, but you're welcome to try whatever you think might work. If you're looking for patterns in the cards, you won't find it hard. Many casinos have a board up that tells the cards that have already been played, and others will at least give you pen and paper. Knowing how to play baccarat is not really a matter of card tracking, though, and that should be hinted at by the fact that the casinos would help you track cards. The best you can really do is to be sensible. Although the house always has an edge, look out for when hands keep going to the banker. Most likely, the game will keep going like that. (Take note, this is not based on anything more than common sense.) In other words, anything the casino will give away is worthless, so don't depend on card tracking. Card counting has only limited application with baccarat. 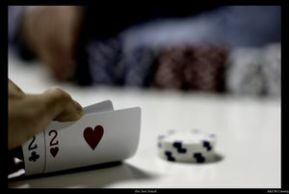 Card counting in general works with well with certain casino games, especially blackjack, if you can do it undetected. The downside with trying to use card counting with baccarat is that this particular game only has three bets, so you don't get a chance to adjust strategies. Plus, cards are usually discarded and placed back into the shoe, so it's probably better to concentrate on the rules for how to play baccarat rather than trying to count cards. If you want the best strategy for how to play baccarat and win, you'll probably have to look at mathematical strategies. The 1:1 odds present the opportunity for the 1-3-2-6 option, which you can read more about in other articles. Another one is the Martingale system. With this one, every lost hand is followed by a hand with a doubled bet, so a loss on a $5 bet means you bet $10 next time. You're supposed to keep going until you win. This one would work fine if you could play long enough to win, but limited time and funds will most likely keep you from using this strategy. Take the best of what these strategies offer and try to figure out your own reliable system for how to play baccarat and win. The truth is, you can't ensure a win, but there's always a way to improve your chances. Good luck!